In 1999, the Wachowski siblings released a strange mix of bravado special FX, elementary philosophy, martial arts-laden combat, and mind-bending plotlines in an influential science-fiction actioner. 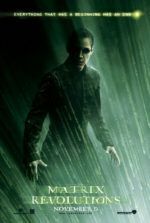 The Matrix became a phenomenon ripe with possibility and led to a franchise that, overall, remains entertaining but underwhelming, if only because this first film in the trilogy sets the bar very high. Existing in a cyberpunk world where the imagination sets the limits of possibility, the film operates in languages ranging from computer code to kung-fu, offering a wide array of genres all blended into this otherwise classical tale of good versus evil. And while continuously exalted by its fervent, jealously defending fans, the film seems smarter than it really is and, even while being smarter than the average actioner, has been propelled to impossibly high realms of greatness. Even though the Wachowskis never forget to engage the mind in talk of the nature of reality and humanity, which are then compressed into symbolic acts (such as swallowing a pill to demonstrate a belief), the film too often resorts to wistful gunplay and impressive, CGI-enhanced acrobatics, all of which viewers have seen before, though rarely better. Shot for $44 million in Australia, Andy and Lana (then credited as Larry) Wachowski wrote The Matrix prior to their 1996 debut feature, the stylistic crime-thriller Bound. And in the wake of The Matrix’s franchise legacy, it’s interesting to think back to what must have inspired them. In thinking about this, our thoughts become rooted in 1990s culture. To be sure, even while pointing toward the future, The Matrix also encapsulated much of the ’90s. By the middle part of that decade, hopes for virtual reality technology were still very high, computer hackers were becoming more stylish than nerdy (see Hackers), and dark alternative music filled the radiowaves (Marilyn Manson, Ministry, and Rage Against the Machine). As a result, the Wachowskis applied their unique vision to these elements and imagined a world where the savior of the human race is a hacker who hangs out at underground goth clubs. In 1999, nothing could be cooler. But more than just being the right movie at the right time, the Wachowskis also created a carefully assembled and highly stylized product, thanks in large part to the expert lensing by cinematographer Bill Pope, who also shot Bound. Every scene and sequence looks labored over, every shot carefully planned out, and the color palette beautifully composed. Because of the filmmakers’ tireless efforts, The Matrix‘s visual identity is almost mythic in a way its successors failed to achieve. If you’ve been in a bubble and haven’t seen it, the film centers on Thomas Anderson (Keanu Reeves), who leads a double-life: an office worker by day, and by night, he’s a talented but restless hacker that goes by the handle “Neo”. 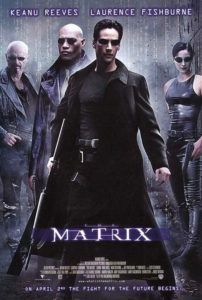 Contacted by a group of wanted hackers, headed by Morpheus (Lawrence Fishburne) and Trinity (Carrie-Ann Moss), Neo learns that agents obsessed with finding Morpheus’ secret group are hunting him. The agents’ leader, the dastardly Agent Smith (Hugo Weaving), seems maniacally devoted to stopping Morpheus and all that he represents. Strangely, when he and Morpheus’ soldiers engage in combat, the action bends the laws of physics. Moreover, they use robotics that look as if they come from far into the future. (And they do.) Morpheus believes Neo is “The One” who has been prophesied to save the real world, not Neo’s fabricated fantasy, from machine rule. Here is where the Wachowskis’ screenplay falls into long processions of expository dialogue between Morpheus and Neo, whereby Morpheus explains the way of the world to The One. Rather than just tell him he’s been living in a computer-generated illusion, Morpheus talks in cryptic riddles and uses virtual reality visuals to illustrate his point. The short version is that machines have bred Neo and most other humans on the planet as a source of energy. Sometime in the 21st century, humans and machines went to war; the machines won and subjugated the human race. Born into embryotic pods, the human slaves never experience the dark truth of their reality; rather, the machines have constructed an intricate simulation called The Matrix, in which human beings carry out their lives, never aware that they are essentially feeding their captors. But a rare few inside The Matrix search through computer codes and look for meaning. These hackers are eventually identified and pulled out of The Matrix by others who have already escaped—a resistance that lives in an underground city called Zion. Morpheus explains that long ago someone prophesied the arrival of The One and through him the end of the war. Neo doubts Morpheus’ claims, and his misgivings only seem to be supported by Gloria Foster’s wise Oracle. 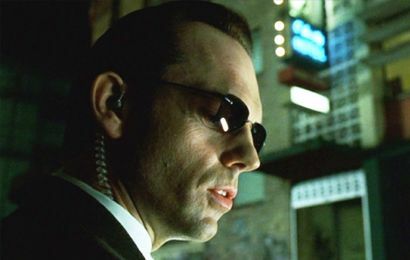 But Morpheus’ group, surviving on a magnetic ship in the post-apocalypse, has a traitor: Cypher (Joe Pantoliano), who has sold Morpheus’ whereabouts to Agent Smith so he’ll be allowed back into The Matrix, his knowledge of the real world erased forever (“Ignorance is bliss,” he explains). Once Agent Smith captures Morpheus, Neo and Trinity must lead a daring rescue mission, during which our hero discovers his prophesied abilities as The One: he can manipulate reality within the Matrix, allowing him to dodge bullets and leap great distances at will. Laden in black leather, sunglasses, and machine guns, the finale plays out in almost constant slow-motion, leading to our sense that greatness unfolds before us. Before long, good trumps evil (at least, Agent Smith, not the greater robot threat), and the rebels prevail. By the final scene, when Neo calls out to others in the Matrix who may be listening, and then flies into the air like some comic book superhero, the Wachowskis’ visuals have created their own iconographic language, and the viewer cannot help but be swept away. One of the lingering quibbles for this critic remains the underdeveloped love story between Neo and Trinity. It is, after all, a major dramatic factor in the film and a central plot point to Neo’s emergence as The One, as Trinity’s faith in him plays a crucial role in Neo becoming a messianic figure. She’s been told she will fall in love with The One, and she knows it’s Neo when she falls for him. But the Wachowskis offer audiences not a solitary scene that would help us understand why Trinity falls for him. The screenplay lacks any insight to her motivation beyond her hero worship, while Neo understandably finds Moss appealing at least for superficial reasons. 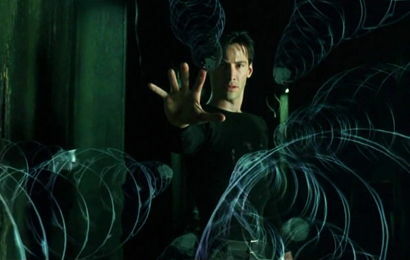 After all, Reeves isn’t an expert when it comes to emotive performances, and besides fighting for his survival in a number of rousing action sequences, his character doesn’t do much beyond listen to Morpheus’ exposition about how the world is not as it seems. Trinity, too, is a tough cookie, but she’s one of many characters in the film who is two-dimensional at best. It’s curious that the two most engaging, passionate characters are Morpheus in all his devotional certainty, and Cypher, the duplicitous side-villain. Of course, my quibble can be explained away by the film’s thematic underpinnings about Predestination vs. Determinism. Did Neo knock over the vase in the Oracle’s kitchen because she told him he would, or because it was his destiny to do so? Did Trinity fall in love with Neo because the Oracle prophesied she would, or because she genuinely fell in love with him? The Wachowskis embed a considerable amount of hypothesizing and philosophical waxing, all rooted in broad theory appropriate for an undergraduate Philosophy 101 course. Detractors have remarked about the very basic nature of the literary, mystic, religious, and philosophical references throughout the film—that it’s clearly trying to be smart but could have been a lot smarter—but remember, this is an action movie, first and foremost. A hint of philosophical insight automatically places it a step up from others like it. What the Wachowskis did with The Matrix is collectively raise expectations for actionized fare; such films no longer needed to be dim shoot-em-ups, but could put some brainy concepts behind the action that would test John Q Moviegoer. Its own considerable measure of hints and philosophical Easter eggs leave behind just enough for viewers to mull over, and while they may not be mind-blowingly original, they’re getting the average commercial action fan to think a bit more, which can only be a good thing. In that respect, The Matrix never fails to entertain or inspire awe, from the CGI post-apocalyptic futureworld to the FX-enhanced fight sequences. Its eye-popping effects have been designed both to deliver something new (in its day) and something that has a visual correlation to the story. Inside The Matrix, the laws of Nature and reality can be manipulated by freedom of thought. To illustrate this, visual effects supervisor John Gaeta famously employed “bullet-time” and hyper-slow-mo (a technique invented some years prior, and notably used the previous year on the Lost in Space feature). The result allows characters to dodge blows and bullets, leap incredible distances, and melt reality as we know it. Countless action movies and martial arts fare have borrowed these visuals, so we’ve been following slow-mo bullets and spinning around action heroes stuck in a freeze-frame ever since The Matrix’s release. 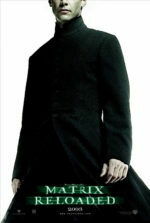 What’s more, once Neo realizes the full extent of his powers, he becomes a kind of superhero with telekinetic abilities whose limits are never completely defined. The ambiguous promise held by Neo’s abilities, and how they might manifest onscreen, culminate in the conclusion of The Matrix’s indescribably exciting last shot. If only the sequels lived up to that promise. Benefited by a sense of discovery that its subsequent two entries lack, The Matrix challenges viewers to consider their world a construct of perceptions and virtual reality that, through the power of thought, can be broken down and controlled. At the time, audiences responded with wild enthusiasm, creating a sort of cult-of-The Matrix that boasted over the film’s originality, despite many similar themes and twists being present in Alex Proyas’ Dark City the year before, and other films like it. But the initial film’s legacy carries beyond its subsequent entries and, as a stand-alone film, remains a thrilling and visionary piece of innovation. Perhaps overestimated, but thrilling and visionary. Few pure action movies have dared to be so much, and further succeeded so thoroughly in making general audiences think about the world around them and how they perceive it. By remaining so accessible yet intelligent, The Matrix transcends its narrative downfalls through its influence and insight—characteristics that continue to define the Wachowskis’ unique brand of smart entertainment.